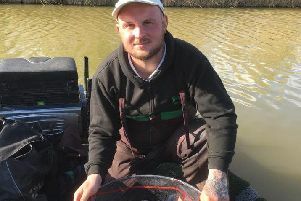 Simon Godfrey won the big Decoy Lakes Festival event. One of the best field for some time lined up in the big Decoy Lakes Festival for oen of the most sought after titles on the local scene. However it all went wrong for some of the favourites during a difficult first day. Steve Winters looked like the man to beat going into the final day, but Whittlesey rod Steve Godfrey took a lake win on day two from the Oak Pool with a fine 218lb and then put in a brilliant performance from unfancied peg 12 on the Beastie Pool, fishing shallow to round off the day with 180lb 6oz and another lake win. That saw Simon and Steve tied on eight points, but Simon had a better aggregate weight to be crowned King of Decoy Lakes. Young Tom Edwards finished third. Day One: Beastie - P. Goldstraw 147-4-0; Six islands - B. Roberts 175-12-0; Oak - V. Cross 157-15-0. Day Two: Beastie - K. Wadge 227-11-0; Six Islands - S. Freeman 147-7-0; Oak - S. Godfrey 218-9-0. Day Three: Beastie - S. Godfrey 180-6-0; Six Islands - R. Goodson 111-12-0; Oak - J. Binder 142-6-0. Overall: 1 S. Godfrey (Sensas) 8pts, 2 S. Winters (Bait Tech) 8, 3 T. Edwards 11, 4 C. Barley 13, 5 L. Kendal 13.